Food quality! This smooth, fabric-reinforced drinking water hose is absolutely toxin- and cadmium-free. Available in blue for cold water and red for hot water, for temperatures up to 110°C. Smooth, fabric-reinforced drinking water hose in food quality. Absolutely toxin- and cadmium-free. Available in blue for cold water and in red for hot water. 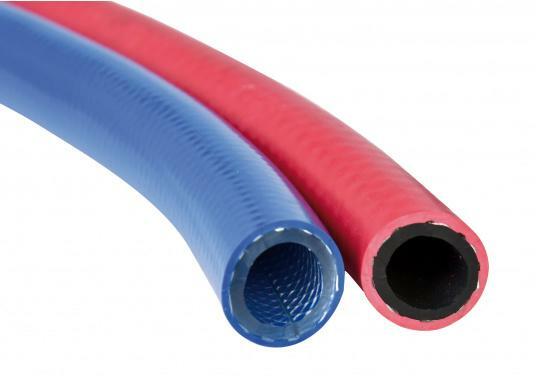 The hot water hose is suitable for temperatures up to +110°C. Nominal diameter: 13 mm (½"). Exterior diameter 20 mm. Price per meter. gute qualität, ich verwende diese schläuche schon viele Jahre, sie sind geschmacksneutral, gut biegbar, haltbar und werden nicht brüchig. sowohl mit kalt- als auch warmwasser gut geeignet.